Approx. Weight: 10 lbs. 5 oz. 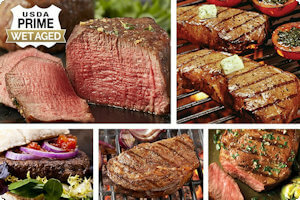 A collection of premium steaks brought to you by Chicago Steak Company. This vintage collection of aged beef (minimum of 28 days) is composed of wet-aged USDA prime cuts of the most popular artisan-cut steaks for the cultivated palate. Each steak is hand-selected and hand carved by experienced butchers. The wet-aged, succulents strips of beef are a perfect gift or you can treat yourself and your family on this diverse prime assortment.